UW Bioengineering is a joint department in the UW School of Medicine and UW College of Engineering. Our students, faculty and staff benefit from access to award-winning faculty, renowned researchers, premier research hospitals, clinics and labs, and rich opportunities for experience and research partnerships. UW Bioengineering values open collaboration with researchers within the department and across campus. Our culture of collaboration welcomes new ideas and supports new partnerships. These relationships define the latest frontiers of research, and integrate ideas and perspectives from a wide range of disciplines. UW Bioengineering features a low faculty-student ratio and opportunities for collaborative research. Our small class sizes enable students to have access to faculty and instructors who get to know them on an individual basis. Undergraduates can begin conducting lab research as freshmen, if they choose, and graduate students benefit from a collaborative and supportive research environment. 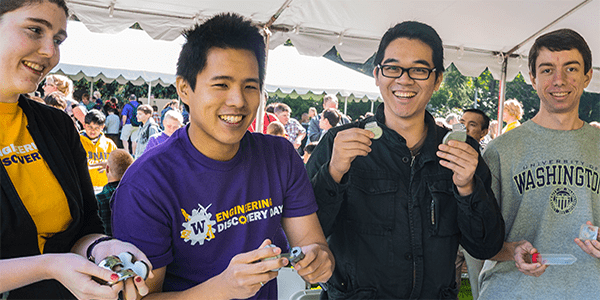 UW Bioengineering is home to strong student support groups and a unique sense of community. Our students find a place to fit in and get the support they need. Here, students find like-minded individuals with whom they can share academic challenges and develop ideas. UW Bioengineering maintains robust relationships with Seattle’s vibrant bioengineering industry and global health organizations. Through research partnerships, internships, classroom guest speakers and events, UW Bioengineering students gain real-world experience and a competitive career advantage, as well as the opportunity to become part of new healthcare solutions.